I am well known for not travelling light, last year I had to pay extra as my bag was over weight! But this year I think I have it down to a t, I have been collecting sample sizes and travel sizes of loads of products from beauty boxes so I am mainly taking them! Even though these products don’t all fit in my toiletry bag but hey, can’t have everything! This is my skin cleansing section, I am taking a pack of wipes which I can use at night to remove a large amount of make up so that I don’t waste my face wash. Since taking this photo I have actually down sized my face wash to one that’s nearly empty and also a travel sized container from Sephora. I am taking my little pink brush as I find this helps exfoliate my skin. I am also taking the Eve Lom cleanser to try out one night. In the small white bottle that is some Clean & Clear blackhead toner along with some cottonwool. This is the in shower section and is fairly small so I am very proud! I am taking this razor which I recieved in a beauty box and have been saving it especially for this holiday. I also have 2 shower gels from Korres which are perfect for travelling. And lastly I thought I would try out the St Tropez in shower tan to give me a bit of a boost on the first few days. This is probably the biggest section as its a lot of minis and packets of samples. I am taking a small shampoo and conditioner, the conditioner will run out quickly on my hair so I am taking some moisture masks for my hair and repairing ones. I also have packed a heat protectant, a sea salt spray and a leave in conditioner. This is probably the most amount of face masks any one has taken on holiday but they are my weakness! I have 3 face masks and will probably spilt the 2 bigger ones over 2 days each as they have a lot of product in them. I then have a sheet face mask from Sephora and some eye masks and lip masks. As my skin is our in the sun for a whole week I really want to give it a good pamper. I like to make sure I have a good moisturiser every night, and as I will end up washing my face twice a night (before dinner and after dinner) I want to make sure I have a light weight moisturiser to wear aswell. All of these are samples and more pricey brands so I feel like I’m posher on holiday. I have the IOMA moisturiser capsules, Vichy and Naobay moisturiser. In the clear bottle is a vitamin e spray and then finally a Caudalie eye cream. Now onto my body skin care, as I will be tanning I want to make sure I keep it moisturiser at night to maintain my tan. I have an after sun from Malibu and a body lotion from Soap & Glory. I then have been dying to try this shimmer body oil from No7 for the longest time so of course I am taking that! And then I have a gradual self tanner just Incase I miss some bits when I’m tanning. And now to smell good, a deodorant of course. 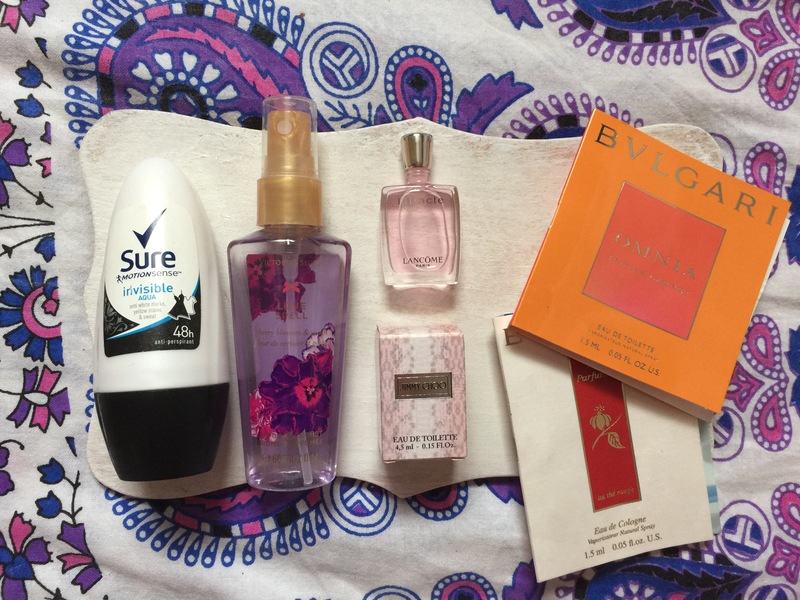 And a mini body spray from Victoria’s Secret along with some minis from some of my favourite perfumes. And finally my choices for sun protection. I like to use oil but I also like have a proper cream just Incase I want a bit extra protection. I also have a spf 30 for my face and a spf lip balm so my lips don’t burn and they stay hydrated. Next Post Why I havnt been blogging!